I’d like a website layout other than those provided, is this possible? Can the titles of the pages included in the website be changed? What makes your websites different than other veteran website offerings? Can I move my website to another website hosting provider? Is it possible to change the template my website uses? Do I need to do anything to renew my website domain name? My post already has a website, can I still use your service? After I order, how do I get my website information to you? Can I make changes outside the allotted website updates? Use our website contact form to ask questions not answered here. Yes, we can design a custom website template exclusive to your post for a one-time design fee of $325.00. The annual or monthly website hosting fees would be based on the features you would like to include on your website. There is also a one-time $90.00 fee to setup your website and place your post's content on the site. Yes, if you do not need one of the standard pages offered, you can remove it or replace it with another page of your choice. For example, if your post does not have an auxiliary, that page could be replaced with another page or removed entirely. Your post will be responsible for providing all content associated with the new page. The standard website package allows up to 10 email accounts and the enhanced website package allows up to 20 email accounts. Since officers of most posts change on an annual basis, we recommend email addresses such as commander@yourpost.com, quartermaster@yourpost.com, auxiliary@yourpost.com, steward@yourpost.com, etc. These email addresses can then be forwarded to any email address of your choice. When the people in these positions change, we simply update the forwarding email address for you. We are a veteran owned company providing our services to other veterans. You get your own stand-alone website and domain name instead of a sub-directory of our website. Our website costs are lower than most similar services. Our website package features far exceed similar services. You may have unlimited access to your own website hosting control panel if you want it. Email addresses at your domain is included free of charge. 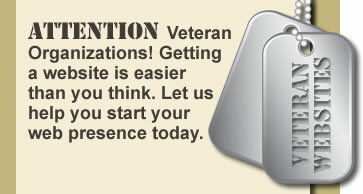 We allow you to earn money for your post by recommending us to other veteran organizations. Because the website templates are provided at no charge to your post, they remain the property of Veteran Websites and First Capital Web Services and cannot be moved to another web hosting provider. Custom website designs may be transferred to another website hosting provider once all initial fees have been paid. While we will provide you with all of the access information necessary to access your website files, we cannot assist you in setting up your website with another website hosting provider. Yes, simply pay a one-time fee of $90.00 and we will change the website template for you. This fee pays for setup of your website and transfer of your website content to the new template. There is no need to repay the website hosting fee unless your hosting account is up for renewal at the time you change the template. As long as your domain name was registered through us, or you transferred your existing domain name to us when you ordered your website, there is no need for you to renew your domain each year. We will automatically renew the domain for you. The price of domain renewal is included in your recurring website hosting fee. If you have your domain name registered somewhere else, you will be responsible for renewing the domain and paying any associated fees. Yes, if you are unhappy with your current website or simply want a new look, you may order one of our website packages and templates and we will transfer your existing website content for you. After your website order has been processed, we will provide you with a checklist of the types of information we will need and provide you with instructions on sending that information to us through email, FTP or by using submission forms on our website. Yes, we can make changes to your website at any time. Changes requested outside those included in your website package will be made at a reduced hourly rate of $35.00 per hour. If your post has access to website design software, you can also choose to make the changes on your own. We will provide you with the login information you will need to download your website files for updating.